We’re into the last few weeks before Baby Higgins makes an appearance (whenever he decides that will be between now and 29th July!). I’m almost at 34 weeks and time has been flying by rapidly. I thought I’d take a breather and share a few things about how my third trimester has been so far – here goes. Just as I have been throughout the second trimester, I’ve still had lots of energy and to be honest, carrying on as normal with my life: Daily morning workouts and 5-6 mile walks, working at nearly full capacity with my freelance work and blogging projects, plus of course making time to go to events, see friends and spend time with Mr Higg. 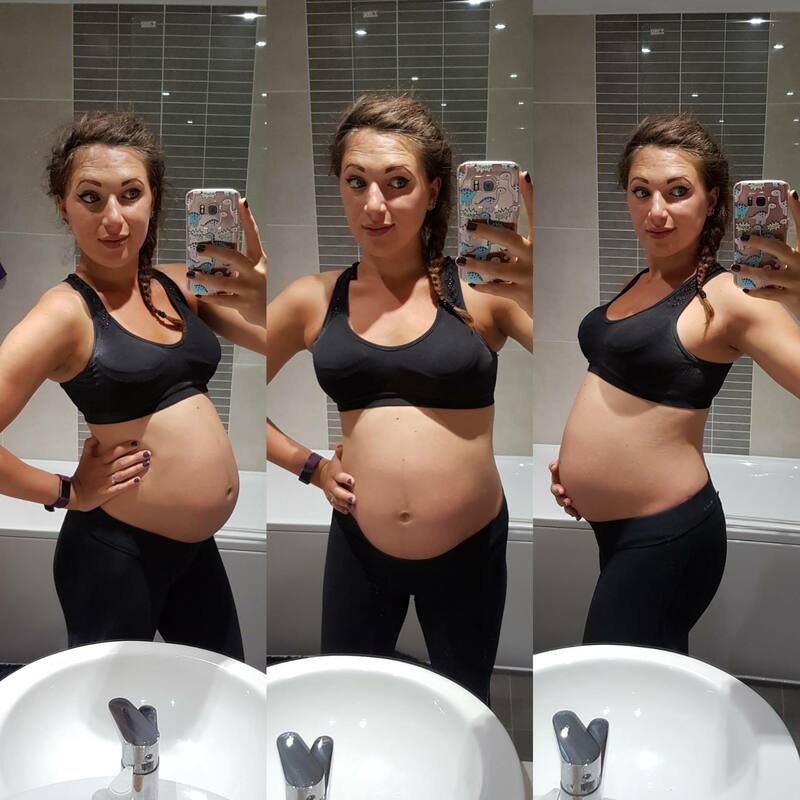 I truly believe that keeping fit, active and busy really helps to keep you positive throughout pregnancy, plus of course in terms of your body I’ve not noticed any significant weight gain other than my bump. 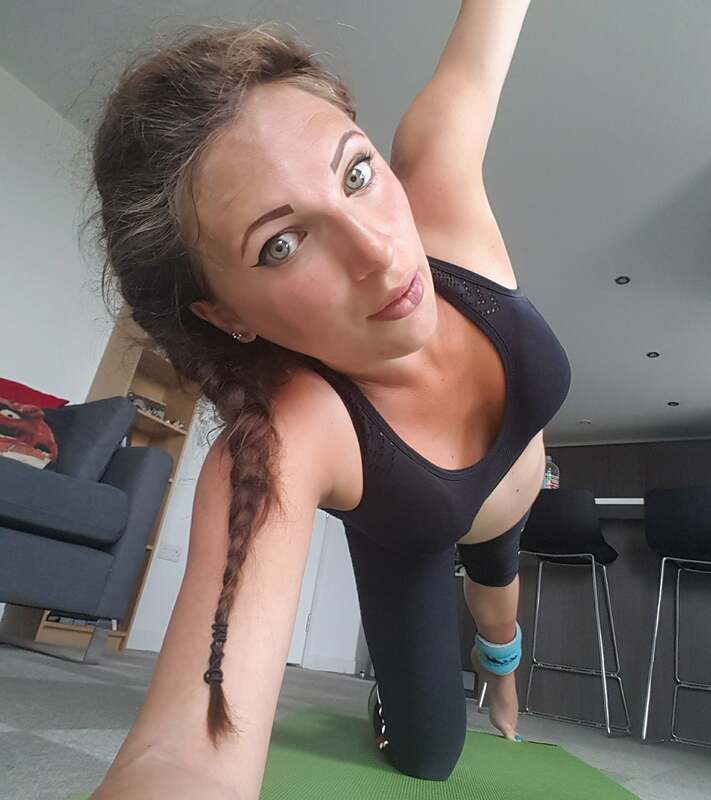 I’ve also been listening to my body and making sure I chill and rest in between the activity – in the heat my feet sometimes feel swollen so I need to put them up for a few hours later in the day and use peppermint cooling foot/leg cream – lifesaver! I’m also not even kidding when I say my feet have gone up a shoe size (I wonder if that will be permanent…goodbye shoe collection). As bump is getting bigger, my appetite is the same but I’m having to spread out my meals more and eat little and often as my tummy gets full quite quickly. I’ve not suffered heartburn yet but I’ve got a pack of sugar-free Rennies on me in case it hits! 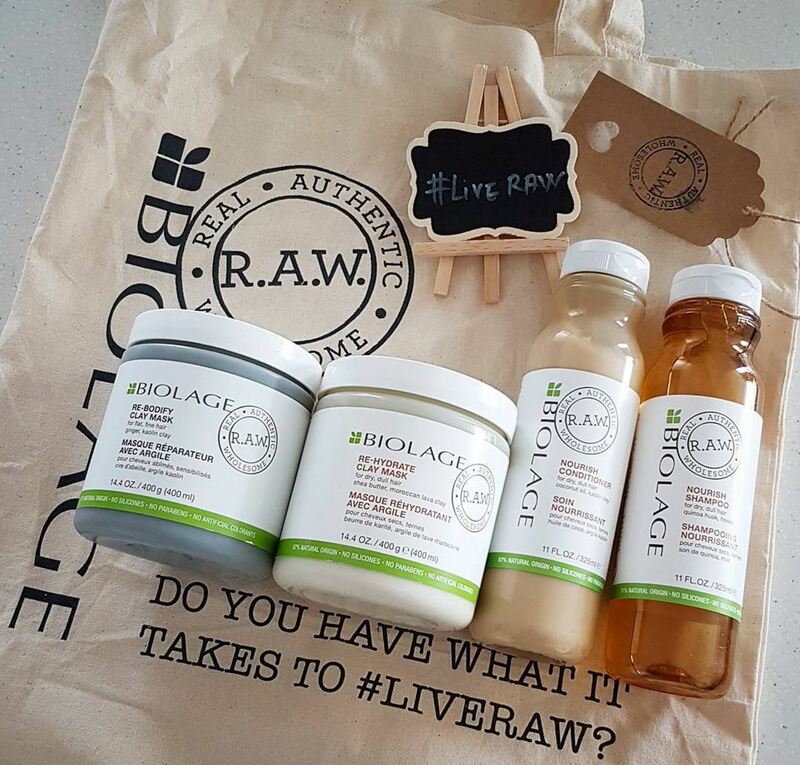 I’m really happy with how my skin and hair are looking – I think that’s a combination of hormones being nice to me, following a healthy diet and taking pregnancy multivitamins plus using Mustela products and Biolage RAW haircare shampoo and conditioner. 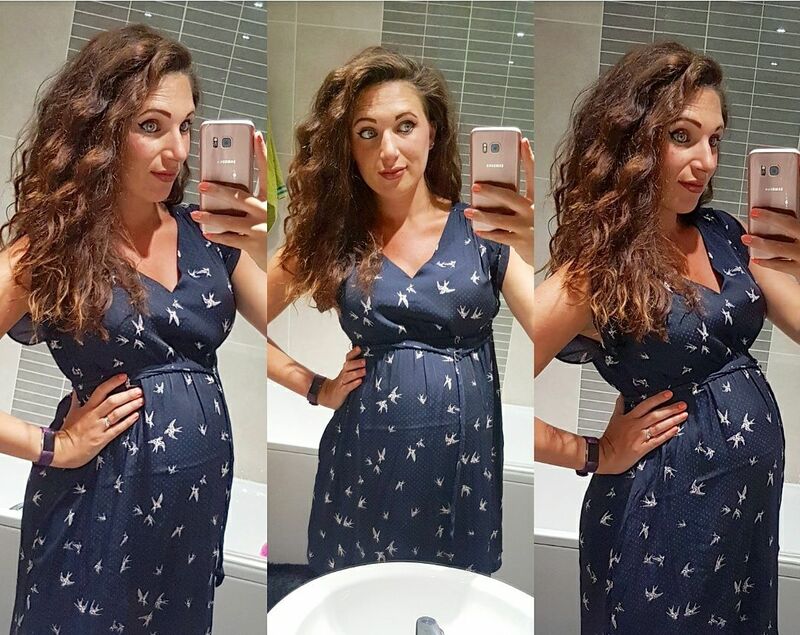 My midwife even commented on the skin on my bump, saying it was in “incredible condition” which made me feel very happy indeed – no stretchmarks in sight! The only other thing I’ve been suffering alongside swollen feet is the urge to need a wee every 20 minutes – whether I’ve had a drink or not. When out and about, it can feel quite uncomfortable and I’m always on the look-out for toilets so I can make a dash if I need to! Oh, and I’ve mostly been feeling positive and happy but on a few occasions I’ve been overcome by emotions and just burst into tears for no reason – totally unlike me but I’ve just let it out and carried on as normal! Our little bean seems to move and kick about once I sit down later in the afternoon and especially when I go to bed and lie down on my side. 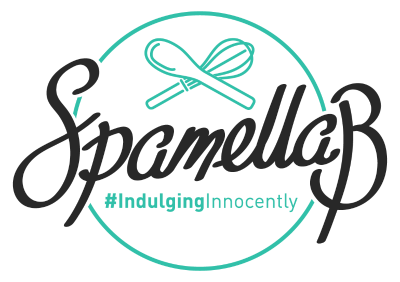 I can’t describe the feeling but it’s a mixture of weird and amazing – rolls in your tummy which you know ain’t your stomach! At this stage I’m feeling quite large and ‘heavy’ – there’s less and less room for him as time goes in and it can feel a bit squashed – not very comfortable. A few times I’ve felt a twinge up in my ribs where I’m pretty sure he’s sticking his foot, little rascal! I see the community midwife once every 3 weeks at the moment and at these check-up appointments she tests my urine and blood pressure (all fine), the growth of my bump (bang on in the normal range) and the best part – listening to baby’s heartbeat which is healthy. I’d absolutely love to be able to see another scan each time I went but I guess we just have to wait until he actually arrives now! 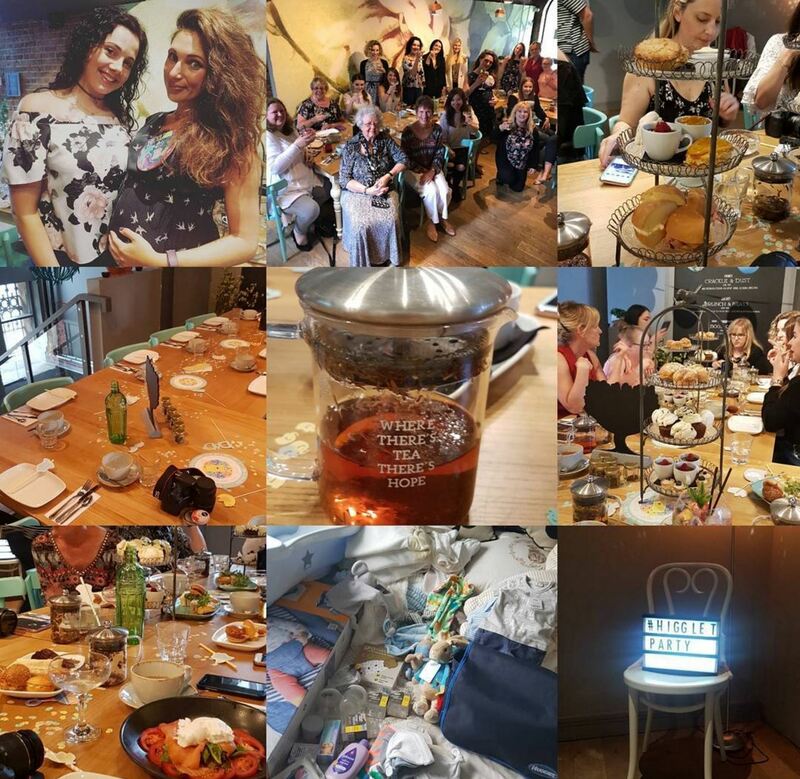 Last weekend I had the nicest afternoon with some special ladies in my life – family and friends – to celebrate my Baby Shower at one of my favourite spots in Manchester, LEAF. We indulged in afternoon tea, cocktails (obviously a mocktail for me) and it was just lovely to get everyone together. Baby was well and truly spoilt too, he received some wonderful gifts! 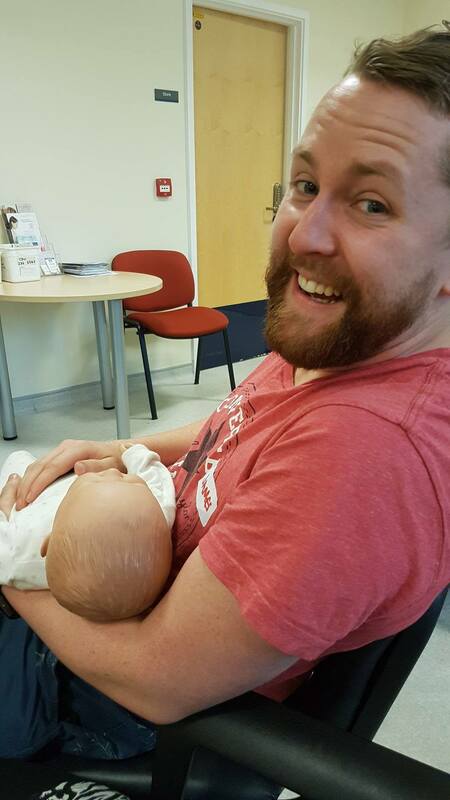 James and I have been to two out of the three antenatal classes held at our hospital, Saint Mary’s, which have been brilliant and informative. So far we’ve covered labour, pain relief, postnatal care plus the basics of how to bath, change and put a baby to sleep; I’m a natural worrier and control freak so I feel better now that I know more about what to expect! It’s also made me massively appreciate my body more, the whole thing is just fascinating and it puts things into perspective. We’ve also spent a bit of time shopping so we’re fully ready when baby arrives. 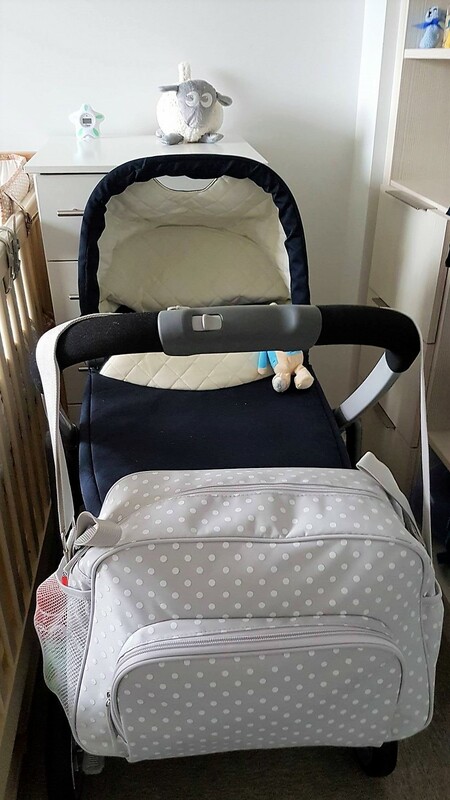 I scoured the internet – blogs and sites like Bounty – to write a list of things we actually needed which has been a god-send when we’ve been in baby shops – it can be so overwhelming and it’s easy to just buy everything. We’d rate Mothercare, Mamas & Papas, John Lewis, Boots, Primark and George at Asda for essentials at affordable prices. I’ll be doing a nursery tour blog post with what we’ve ended up getting so stay tuned for that! 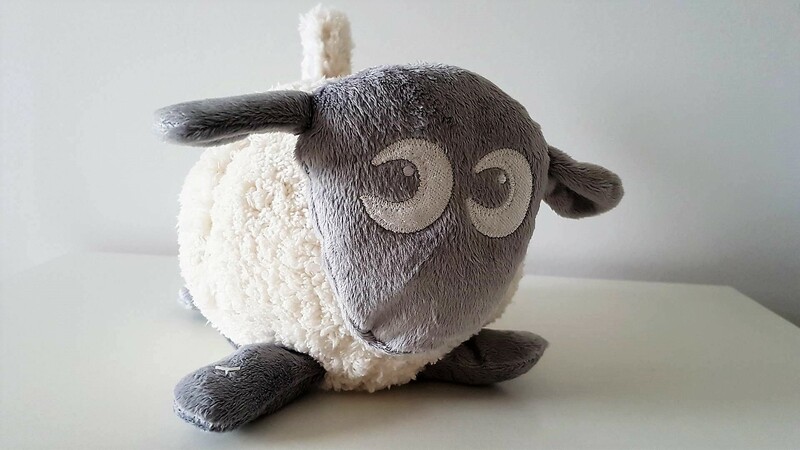 I’ve seen this recommended by numerous sites and blogs: Ewan combine a range of 4 soothing sounds, including real womb and heartbeat sounds, combined with a glow to create a soothing environment that helps to settle baby to sleep. I’m interested to see how this actually works in practice! I didn’t want to spend a fortune on a bag to carry around with the pushchair so was chuffed to find one in Primark for just £12 (others I’ve seen range from £30-£100+). It has separate compartments, dividers and a foldable changing mat – what more could you want? I’ve already packed it with baby’s things for when we go to hospital! I used to use one as part of my workout but after being told how good it is towards the end of your pregnancy and even during labour I rushed out to grab a new one. A bargain from Aldi, I’m looking forward to bouncing around on it to help with posture and once the contractions start – eeek! 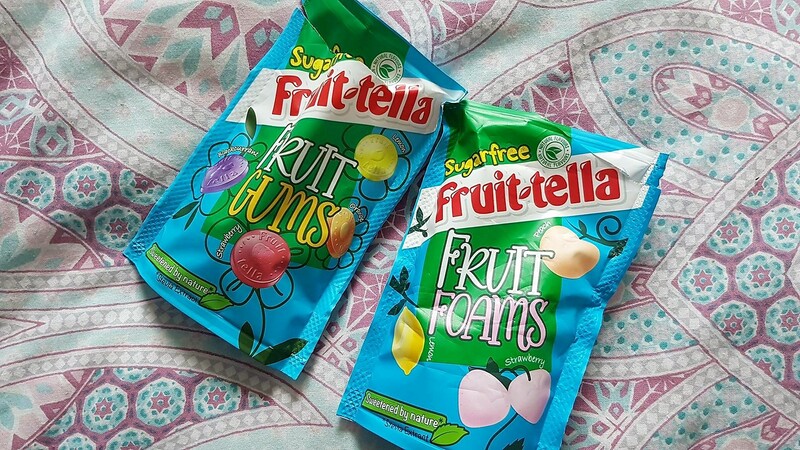 Although my main cravings have been savoury-based, I LOVE chewy soft sweets so finding these sugar-free fruit foams and gums has been my guilty pleasure. Sweetened with stevia, these are great when I feel like a sweet fix or when I’ve been on my long walk and need a little energy boost. 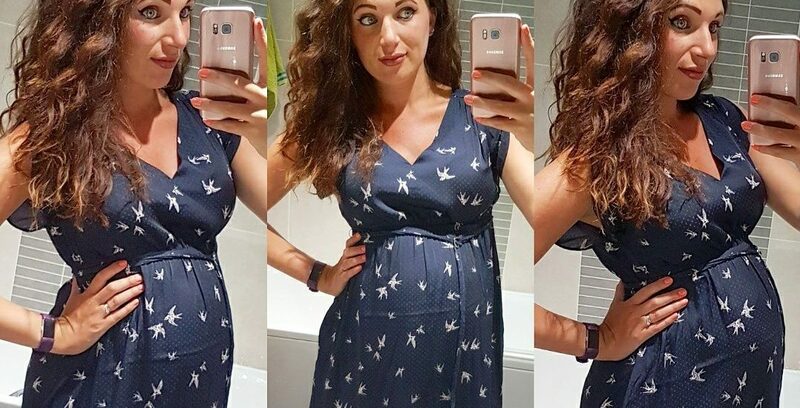 As I’ve mentioned in a previous post, I’ve hardly bought any maternity clothes – only some jeans plus two gorgeous dresses from H&M – their Mama range is brilliant and really affordable. With it being summer it’s nice to be able to wear dresses and these two fit nicely just above the bump.